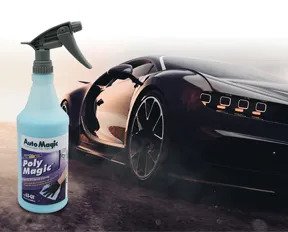 Auto Magic’s Poly Magic Polymer Protectant Coating is an advanced, high-gloss express polymer spray for use on wet or dry surfaces. It is static resistant, helping to repel dust and maintain a deep shine. It offers UV protection to help protect against the damaging effects of the sun. The versatile product goes on fast, has a long-lasting shine, and helps protect today’s advanced exterior finishes. Toll free fax: (800) 729-1560.